One final Coachella-related post before I shut up about the hot, loud weekend for another fifty-one weeks. 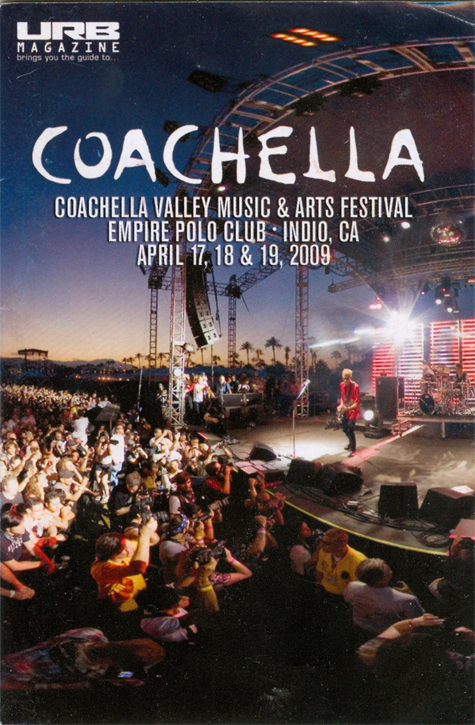 At least two versions of the Coachella pocket guide were released this year: one featuring a day shot of the main stage — featuring some so-and-so with long hair and a sea of people listening to him play his guitar — and a second one featuring the Love and Rockets evening show from last year’s concert. It has been pointed out to me that the second version, pictured above, features my friend York, whose snapped the Coachella photos from both this year’s concert and last year’s — which, in turn, accompanied Aly’s articles for this year’s concert and last year’s. 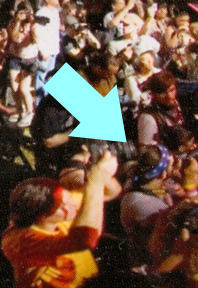 Sure enough, there he is, wearing a blue bandana and being eyed suspiciously by another shutterbuggery enthusiast immediately north of him in the photo. Makes me wonder if I showed up in any promotional images following my stint in the photo pit a few years back. Here, by the way, is York’s highlight real. And way to go on being unconsciously viewed by legions of sweaty-palmed hipsters.